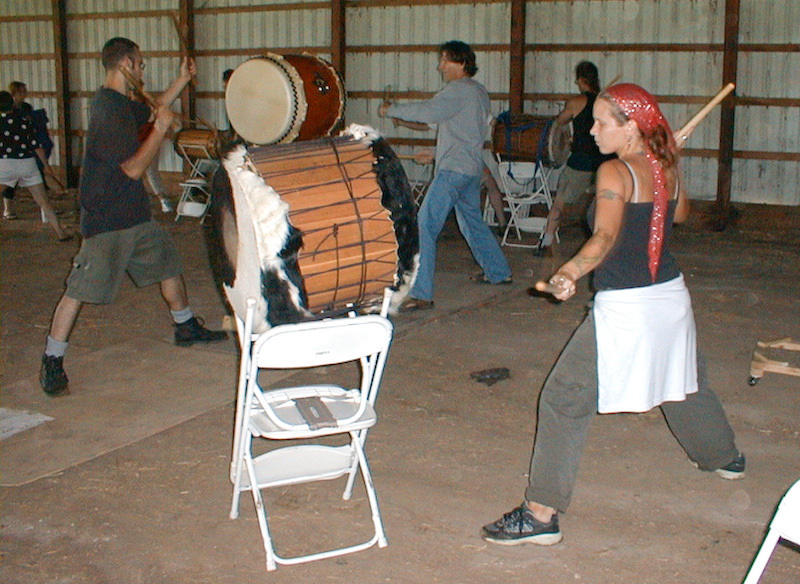 About 20 years ago, the idea to start a drumming and dance festival in Indiana was born on the back steps of Sally Childs-Helton‘s house in Indianapolis. We had been drumming in the basement, and when somebody said “We should do a festival or something” Steve Lange replied “I live at a retreat center—we could do it there.” And thus was born the Midwest Drumming and Dance Festival. Steve and Sally got their heads together, identified teachers, and put out the word. The rest, as they say, is history. The Midwest Drumming and Dance Festival grew rapidly in its first few years, focusing strongly on West African drumming and dance traditions. 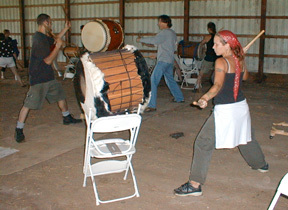 Women were attending as dancers or audience, but weren’t drumming. After these early festivals, women approached Sally and asked for a women-only event, where they could learn to drum without being intimidated by the more competitive male style of drumming they perceived at the festivals. At this point, Sally had been playing percussion and drums for 30 years, and was used to playing with men, but definitely saw the point and thought it would be lovely if more women would learn to drum, and if more men would learn to dance. 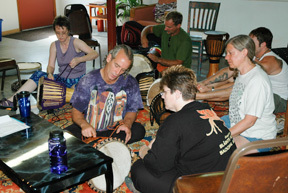 Sally organized the first fall women’s drumming weekend at Oakwood 17 years ago. In spite of her lack of experience at running weekend-long events, the first few annual events went well, and Sally kept expanding the scope of the weekend based on what attendees wanted. A sister event was born 11 years ago, the Ladies’ Spring Fling Drum Thing, based on requests for more than one event a year. Now there are plenty of women drumming at the Midwest Drumming and Dance Festival (and lots of other places), but the early women’s drumming weekends offered a place for women to learn to drum in a safe and supportive environment. There are more men dancing as well, and Sally encourages drummers and dancers of both genders to learn to do both so they have a complete understanding of the relationship between drumming and dance.